Strategic Planning Assumptions: How do You Establish Them? Home » Our Perspective » Strategic Planning Assumptions: What Are They and How Do You Establish Them? Strategic Planning Assumptions: What Are They and How Do You Establish Them? As I write this article, I’m making a number of assumptions about you. I assume you’re a marketer at a manufacturing company or similar industry. I assume you are in the middle of creating a strategic marketing plan. If these assumptions are wrong, this article isn’t going to resonate with you – and it won’t perform very well. As marketers, we are required to make many assumptions in order to build our strategic marketing plan. These strategic planning assumptions allow us to plan ahead with a degree of certainty about how the future looks. What are Strategic Planning Assumptions? Strategic assumptions include any assumptions that are used to build a strategic plan. These assumptions may consist of things that are difficult or impossible to predict. By nature, assumptions can never be 100% accurate, but they are necessary to allow a business to move ahead with their strategic plans. While they can never be validated entirely, strong strategic plans are based on accepted and reliable strategic assumptions. Examples of marketing assumptions may include: assuming no new legislation will affect your industry in the next six months, assuming a price will remain constant, or assuming your customers will want the new product you are releasing. If any of these assumptions are wrong, your strategic plan will be built on a shaky foundation that could undo months of planning and work. That is why it is essential to come up with assumptions that are grounded and validated instead of rushing ahead. Your strategic plan should look at things realistically and critically. Any strategic plan lives or dies based on the quality of the strategic assumptions where it is built. So, how do you identify and establish strategic planning assumptions? Market Assumptions: How will the market respond to your manufacturing marketing plan? Will your product be received well by customers and fit a specific need? Will competitors react in any particular ways? Make assumptions based on the overall market response. Internal Organization Assumptions: Will any changes to the organization affect your strategic plan? Can you assume the same leadership will be in place throughout the project or throughout the planned marketing budget period? Can you assume the company will not be purchased? Machinery and Technical Assumptions: Identify all the assumptions you are making about the technical aspects involved in delivering and marketing your product or project. Will there be any technical issues that affect your strategic plan? Resource Assumptions: Can you assume the same team will be available for the plan? Does your team have the knowledge and skills necessary? Will your planned marketing budget be cut at any point during the year? Once you have a complete list of all the strategic planning assumptions you are relying on, review them critically to determine whether or not they are well-founded. For some assumptions, you can perform market research to determine the validity of the assumptions based on historical market performance, customer surveys, website analytics, and other metrics. Reviewing existing marketing KPIs to determine if any metrics contradict your assumptions can be another good test of your strategic assumptions. Marketing plan assumptions that involve aspects of the business outside of the marketing department can be followed up on. Talk with IT, Human Resources, and the C-level to determine the likely state of the organization and your available resources. Now that your assumptions have been tested and validated, you have a more reliable foundation to make strategic marketing decisions. Make sure you use it! Simply identifying assumptions won’t do your business any good if you are not acting on the new information this identification and questioning unearths. The goal of establishing assumptions in strategic planning should be to uncover long-held assumptions that are inaccurate or strengthening other strategic assumptions to allow you to rely on them even more for decision-making. Avoid the tendency your team will have to revert to their previous way of thinking. After defining your strategic planning assumptions, you are ready to move forward with the remaining strategic planning steps. 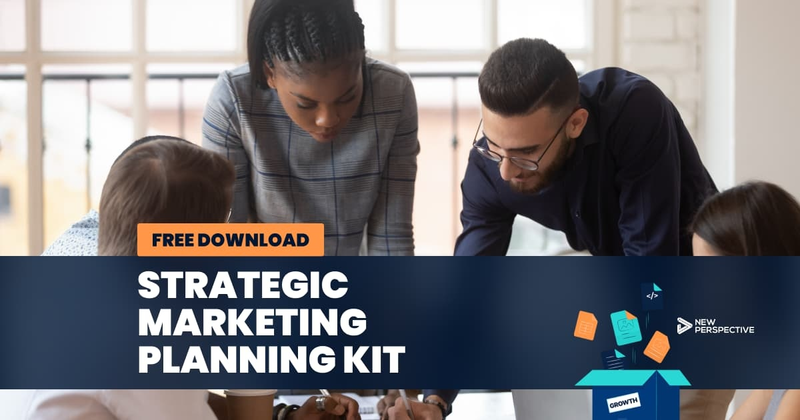 If you’re looking for more resources to help your strategic planning, download our free Strategic Planning Kit for access to the tools and templates we use to create elements of our own strategic planning.